With the whispers of spring in the air, the golf season is officially under way again as the University of Wisconsin–Stout women’s golf team kicked off the spring portion of their schedule at the Washington University Invitational in St. Louis, Mo. The golf season is split between a fall schedule, which runs from September to November, and a spring schedule, which runs through the national championships in early May. Last fall, the Blue Devils closed out the first half of the schedule by finishing second in the WIAC conference tournament last October. Coach Howie Samb said the split season has advantages and drawbacks. In the meets leading up to their runner-up finish at the WIAC championships, the Blue Devils ran off an impressive run of top-five finishes, finishing fourth or better as a team in five straight meets. This includes back-to-back wins in the two meets leading up to the conference tournament, all after finishing sixth in the season opener at Eau Claire, Wis. Junior Brittany McNett-Emmerich from Madison, Wis. was the team’s top golfer last fall, averaging 77.8 strokes per round. In all six meets that UW–Stout competed, she finished in the top-10 individually, including five top-five finishes. Megan Ramp, a junior from Bavaria, Ill., and Mariah Chesley, a junior from Mankato, Minn., were right behind, averaging 82.4 and 83.3 per round, respectively. Maddy Paulsen, a sophomore from Apple Valley, Minn., also averaged under 85 strokes per round with 84.8 over four rounds. Along with McNett-Emmerich and Chesley, juniors Anna Busch of Red Wing, Minn. and Allison Van Heuklom of Middleton, Wis. were the only golfers to play all 12 rounds of the fall season. Busch and Van Heuklom both averaged an 18-hole score of 86.5. Busch said the weather has been the biggest factor working against the team going into the spring. Heading into their first spring invitational, the Blue Devils were ranked 23rd in the most recent Golf World/WCGA Golf Coaches’ Poll. Twelve of the top 25 teams competed in St. Louis, Mo. last weekend. “Because we are ‘new’ to being in the top 25, we have to become comfortable and confident that we belong with top teams in D3,” said Samb. “We are playing the toughest spring schedule we’ve ever played. UW–Stout wrapped up the first meet of the spring season with a 12th place finish, and all four golfers improved their first-round scores the second day of the tournament. Leading the way for UW–Stout was Chesley, who tied for 54th individually with a total score of 169 (85 first day, 84 second day). Ramp tied for 57th (87-83 – 170), Van Heuklom tied for 67th (89-86 – 175) and senior Alex Westman from Richfield, Minn. tied for 88th (94-92 – 186). McNett-Emmerich dropped out the second day after shooting a 76 first round on Saturday. Looking ahead, the Blue Devils will travel to Bloomington, Ill. for the Illinois Wesleyan Spring Fling on April 12 and 13 before heading to the Wartburg College Spring Invitational in Waverly, Iowa on April 18and 19. 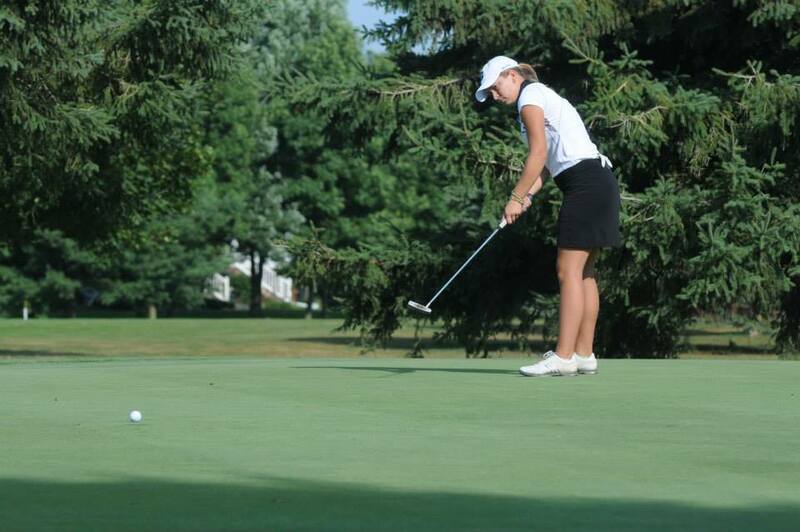 The golf season concludes with the Division III Women’s Golf National Championships in Florida in May.